If Johnny Crowell has a rival for "household name" status in the Carolina airshow world then it would be Bevo Howard. Beverly E. Howard, a little over 21 years Crowell's junior, represents the next generation of airshow pilots in the Carolinas. Although I had direct contact with Johnny at OX-5 meetings and the Camden SC Antique Fly-ins, Howard went out of his way to influence my aerobatic flying abilities; something he is well know for. In this circa 1960 picture from Garrison Bevo's famous hands-off flying style is very evident. 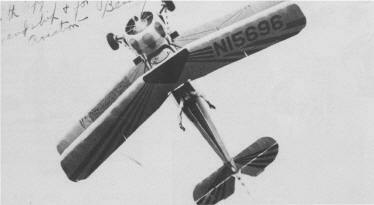 Bevo Howard was the first and only pilot to accomplish an inverted ribbon pickup hands off. Howard was inducted into the ICAS Foundation Hall of Fame in 1996. Read Bevo's Hall of Fame Bio by clicking HERE. Link: Bob Russell relates the TRUE details of Bevo's last flight. PSP, seen here used as a hardstand by the 12th Bomb Group while in Fenny India, has been ubiquitous in worldwide military operations since WWII. Pierced Steel Planking is also known as "Marston Mat." The name refers to Marston NC, a small town west of Pope AFB, where the planking was tested prior to WWII. Aviators have always learned from each other, the tradition of the Instructor/Student relationship continues as we enter the second century of power flight. The tradition of the passing of knowledge is exampled in the next profile. Bob Russell, of Columbia SC, has always driven himself to be the best. From his time at Clemson University. where he learned to fly and started the Clemson Aero Club, to his career in the USAF and the SC National Guard (where he flew the F-80, F-89, F-94, F-86, F-102 and the F-104) Russell always risen to the top of his profession. Bob built his first airplane, a model at age eight. He purchase his first airplane in 1970, a Waco Meteor (Marchetti SF-260), and he wanted to fly airshows. 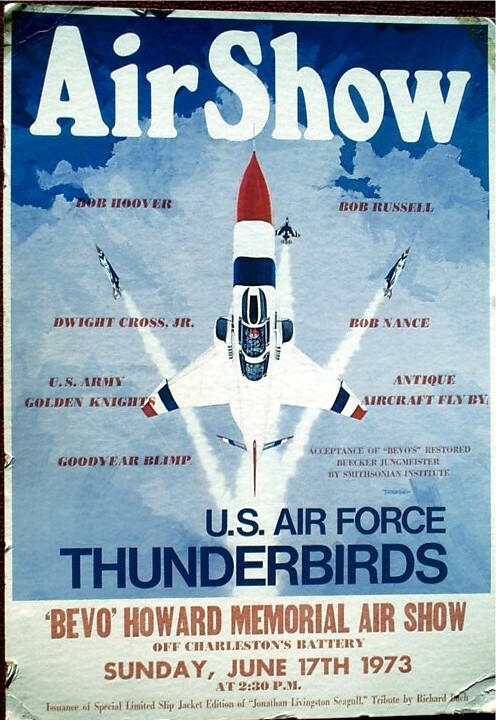 At age 12, Russell had seen Bevo Howard fly at an airshow over Owens Field in Columbia SC, it was natural for Bob to seek advise from the greatest airshow pilot of the time. Howard accepted Russell as a protégé and a long airshow career blossomed across the skies of the Carolinas, the eastern US. I never worked with Bob Russell while he was flying the SF-260. My first association was in the mid 70's when Bob had moved into a DHC-1 Chipmunk. He had been introduced to De Havilland Canada (DHC) trainer by Dr. Joe Newsome, Cheraw SC, who owns a stable of aircraft. Russell, every the perfectionist, continued to modify his Chipmunk. I remember, many times, walking into the Eagle Aviation maintenance hanger at CAE (Columbia SC Metro Arpt) to find Bill Holecek (Eagle's maintenance supervisor and resident A&P genius) with Bob's Chip in many pieces. Over the years, the DHC-1's Gypsy Major engine was replaced by a Ranger (WWII mfg plant in Burlington NC) then a Lycoming GO-480 that turned out 295 HP. The GO-480 was the same engine used in the Heilo-Courier (an aircraft then being sold to Air America (read CIA) and USAF Special Ops by JAARS first pilot, Larry Montgomery out of his Spartanburg SC office (this story does get convoluted!)). Reid Garrison (Anderson SC) allowed me the privilege of flying a number of Chipmunks, most important to me personally was N13A, Art Scholl's original Ranger powered Chip. The DHC-1 is a great aircraft but it stills takes a great pilot to bring those qualities to the fore. Harold Krier, Art Scholl and Bob Russell built an airshow careers on those qualities. I proud to be distantly connected with that legacy. Bob Russell continues to fly and perform in airshows. He now flies an Extra 300, still based out of Columbia SC. PoC: Russell & Jeffcoat Realtors, Inc.
Bob has write an excellent book about his love of the sky: "Touching the Face of God." Published in 1992, its still available from: Bevo Press at the above address .The price is 10.95 a copy. A good read. Hugh Note: I would like to thank Joe Swearingen and Wilson Mills for having the foresight to publish "Aviation Museum 1903-1985 a pictorial history" in 1985 from which many of the above pictures were scanned.